The factory line producing material for the country's first plastic banknotes has been officially opened by the Bank of England's chief cashier. Victoria Cleland called it a "key milestone". 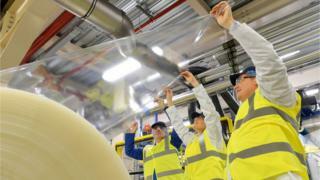 Innovia Films in Wigton, Cumbria, will make the base layer for the polymer £5 and £10 notes due to be released in 2016 and 2017. The factory signed a multimillion-pound deal last year which created 80 new jobs and led to £20m investment. "Although some people have described the move to polymer as 'revolutionary', I see it as 'evolutionary'," Ms Cleland said. "Our decision is not without precedent - across the globe, 45 billion polymer banknotes have been produced and issued by a range of countries including Australia, Canada, Gambia, Fiji, and New Zealand." More than 20 countries use a plastic layer called Guardian, made out of ClarityC, the material the new line will produce. Plastic banknotes are more secure from counterfeiting than the current cotton paper version, the Bank of England has said.